Daily nut servings may lower heart disease for diabetics : Healthcare Asia Daily News | Asia's Leading News and Information Source on Healthcare and Medical Industry, Medical Technology, Healthcare Business and R&D, Healthcare Events. Online since 2010. A daily diet of nut helpings may promise better heart health for diabetics – just one extra serving of nuts a week is associated with a 3% lower risk of developing cardiac conditions and 6% lower risk of dying from heart problems. An American study of diet questionnaires from 16,217 men and women before and after they were diagnosed with type-2 diabetes had asked about their consumption of both peanuts and tree nuts over several years. Of the 5,682 people who died during the study, consumption of nuts was associated with an overall lower risk of heart disease, even after the researchers accounted for other risk factors for heart problems: how long patients had diabetes, obesity, eating and exercise habits, medication use, and how much they ate nuts before they were diagnosed with diabetes. Lead study author Gang Liu, a nutrition researcher from Harvard T.H. Chan School of Public Health in Boston, has said the incorporation of nuts into healthy diets may help diabetics improve things like blood sugar control and inflammation, due to specific nutrients that prevent cardiovascular disease complications and premature death. Tree nuts such as walnuts, almonds, and hazelnuts were more strongly linked to a lower risk of heart disease than peanuts –protective antioxidants are in the consumed outer skin or peel of tree nuts, which are normally discarded in peanuts.However, Liu has admitted that too many nuts may not entirely prevent heart or other health problems. Dr. Emilio Ros of the Hospital Clinic of Barcelona, Spain, has added thatthe extra salt in roasted peanuts might counteract the benefit from its original nut components. Ros has advised no more than one to one and-a-half servings (28 to 42 grams) ora handful of dehulled nuts daily. 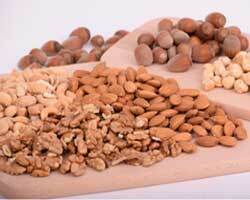 A one-ounce serving of nuts is typically about 24 almonds, 18 cashews, 12 hazelnuts, and 14 walnut halves.